Life is stressful and we often find ourselves so wrapped up in our everyday chores and work that we tend to forget to take care of our bodies and our mind. Have you ever found yourself feeling blue? Often times we can help boost our moods all by changing what we eat and/or what we add and subtract from our diet. Although this is not intended to be a solution to replace other sorts of depression treatments, studies are showing more and more how the foods that we put into our body greatly effect our mood. It is amazing the deference that you can feel both mentally and physically when putting greater effort and thought into what you put into your body. With that said, I want to introduce to you a fantastic smoothie mood picker upper that is sure to put you back on the track to feeling good both inside and out. Toss all ingredients together including ginger and blend well. 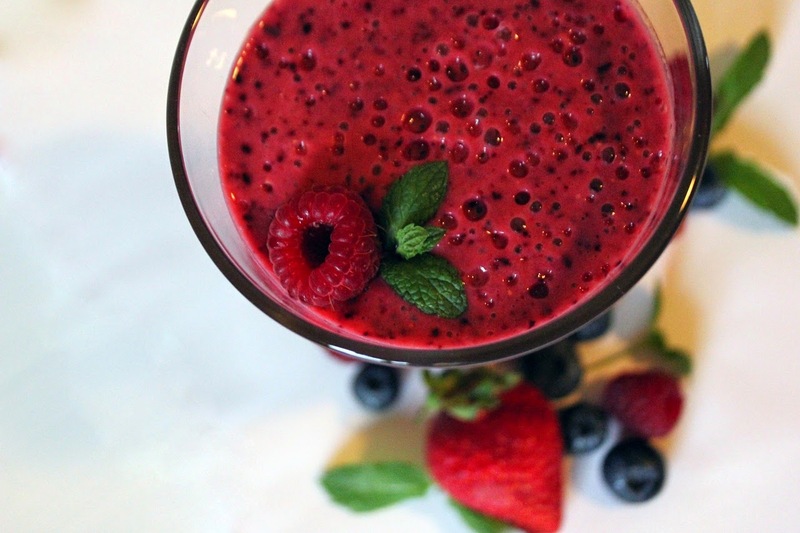 Here is why this smoothie is such a mega mood booster. Raspberries- The antioxidant packed raspberry triggers components that regulate serotonin and melatonin levels giving way for a good mood, good sleep, and have been reported as having anti-depressive effects on us humans. Blueberries - These tasty little morsels have anthocyanins, an antioxidant that is said to protect neurons and combat inflammation that might make us feel down. Blueberries also help reduce depression, and improve short term memory as well as sooth stress. Bananas - These babies contain magnesium, another mood booster! They are also one of the best sources of potassium which cranks up our energy levels, and B6 which is a must for synthesis of dopamine and serotonin which make us happy happy happy. Do you notice how certain foods you put in your body make you feel happy or sluggish? It is delish! Great for starting out any morning! I totally feel better when I am eating better! I'd probably add some almond butter to get some protein/fats in there too. i love throwing liner in smoothies!